The first modern American president, Theodore Roosevelt was also the youngest and one of the most popular, important, and controversial. During his years in office he greatly expanded the power of the presidency. Theodore Roosevelt was born in New York City, New York, on October 27, 1858. His father was of an old Dutch mercantile (relating to trade) family in the city's affairs. An energetic, dominant figure, his father was the only man, young Roosevelt once said, that he "ever feared." As an adult, Roosevelt was known for his great energy and athleticism. But as a young boy, he was very sick. He suffered from severe asthma, a respiratory disease that can cause difficulty breathing. Because of his sickness, he was educated at home by private tutors until the time that he entered college. At age twelve he followed his father's advice and began building his strength through weightlifting, horseback riding, boxing, wrestling, and hunting. He grew to love such activities throughout his life. Roosevelt entered Harvard College in 1876. At Harvard, he developed his lifelong political and historical interests. Four months after his graduation in 1880, he married Alice Hathaway Lee, with whom he had a daughter. In 1882 Roosevelt began the first of three political terms in the New York State Assembly, one of the houses of government of New York state. Upon his retirement in 1884 he had become the leader of the Republican party's reform wing. As a reformer, he gained a reputation for fighting against political corruption (illegal or unethical practices). In his last term, Roosevelt was discouraged by the sudden deaths of his mother and his wife within hours of each other in February 1884. He retired to a ranch in the American West to study history, completing books on the American senator Thomas Hart Benton and the American statesman Gouverneur Morris. He also began writing his major work, the four-volume Winning of the West. Politics and a romantic interest in childhood friend, Edith Carow, eventually drew Roosevelt back east. He married Carow in 1886. The couple had four sons and a daughter. In 1889 he was in Washington, D.C., where he had been appointed by President Benjamin Harrison (1833–1901) to serve on the Civil Service Commission. Under Roosevelt's leadership the group became dedicated to opening equal opportunities for all who were qualified to serve and work in government. In 1895 Roosevelt returned to New York City to serve two years as president of the police board. He enforced the law with relentless efficiency and honesty, which often led him into arguments with the leaders of his own Republican party. He succeeded in modernizing the force, limiting corruption, and raising morale to new heights. However, he resigned from this position in 1897 to become President William McKinley's (1843–1901) assistant secretary of the Navy. As assistant secretary, Roosevelt worked closely with senators in Congress to promote war against Spain. This conflict, the Spanish American War (1898), ended Spain's control of colonies in Latin America and resulted in America's gaining its own territories, including the Philippines. Roosevelt embraced the war mainly to expand America's global influence and because he had exaggerated notions of the heroic glories of war. Anxious to prove himself under fire, Roosevelt resigned from the navy in April 1898 to organize the 1st Volunteer Cavalry regiment. This horseback cavalry unit was known as the "Rough Riders." Roosevelt took command of the unit in Cuba and distinguished himself in a bold charge up the hill next to San Juan. In late summer 1898 he returned home as a war hero and was nominated for governor of New York. Roosevelt won election as governor in the fall of 1898. His two-year administration was full of positive activity. Winning the favor of public opinion and showing himself to be a master politician, he forced an impressive body of new laws and regulations through a reluctant New York Assembly and Senate. In 1900 Roosevelt accepted the Republican vice presidential nomination. A landslide victory for McKinley and Roosevelt followed, but on September 6, 1901, McKinley was shot in Buffalo, New York, and he died eight days later. Roosevelt was sworn in as president. Roosevelt's first three years in office were limited by the conservative policies of Republicans in Congress and the way in which he had come to power. Nevertheless, in 1902 Roosevelt shook the financial community by ordering proceedings against the association of railroad groups known as the Northern Securities Company. When a group of firms or corporations combines or cooperates in order to control prices or reduce competition, this action is known as a trust. Efforts to combat trusts, such as Roosevelt's actions against Northern Securities, are known as antitrust actions. By the time Roosevelt left office as president he had begun forty-three antitrust actions. In his foreign policy, Roosevelt was intent on expanding the United States' global power. He established a somewhat tolerant government in the Philippines, settled an old Alaskan boundary dispute with Canada on terms favorable to the United States, and took advantage of a revolution in Panama to acquire the Panama Canal Zone. Roosevelt's policies aimed at expanding American influence and limiting European power in the Western Hemisphere. The United States, he declared, assumed the right to intervene in the internal affairs of the Latin American nations in the event of "chronic wrongdoing" or "impotence [weakness or inability]." In 1904 Roosevelt ran for a second, full presidential term. He won the election and carried in a great number of candidates to Congress through the influence of his popularity. Roosevelt pushed through a much more progressive program in his second term. One of his primary accomplishments was his drive to protect and to increase development of America's natural resources. By March 1909 Roosevelt's use of his executive power had resulted in the transfer of 125 million acres to the forest reserves. About half as many acres containing coal and mineral deposits had been placed under greater public control. Sixteen national monuments and fifty-one wildlife refuges had been established, and the number of national parks had been doubled. In the area of foreign policy, Roosevelt's impact on the international scene continued during his second term. This was especially true in the Far East. Perceiving that Japan was destined to become a major Far Eastern power, he encouraged that country to serve as a force to keep the area stable. To this end he used his influence to end a war between Russia and Japan that took place in 1904–5. For his efforts, he received the Nobel Peace Prize. Rejecting suggestions that he run for reelection, Roosevelt selected William Howard Taft (1857–1930) as his successor. Taft was elected and this led to disputes within the Republican Party. Caught between the conservative supporters of Taft and the advanced progressive followers of himself and Senator Robert M. La Follette, Roosevelt set forth a radical program of social and economic reforms in 1910. Thereafter pressure to declare himself a candidate for the nomination in 1912 mounted until he reluctantly did so. Although Roosevelt outpolled Taft easily in the Republican primaries, Taft's control of the party organization won him the nomination. Roosevelt's supporters then stormed out of the party and organized the Progressive Party, also known as the Bull Moose Party. During the campaign that fall, Roosevelt called forcefully for federal regulation of corporations, tax reform, river valley developments, and social justice for workers and the underprivileged. But the Democratic nominee, Woodrow Wilson (1856–1924), won the election. 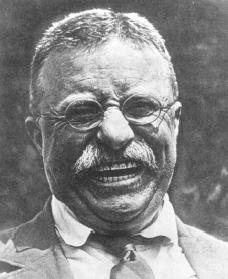 Roosevelt died at his home in Oyster Bay, Long Island, on January 6, 1919. Today, his reputation as a domestic reformer remains secure. Brands, H. W. T. R: The Last Romantic. New York: Basic Books, 1997. Burton, David H. Theodore Roosevelt. New York: Twayne Publishers, 1972. Gable, John A. Theodore Roosevelt Cyclopedia Rev. ed. Westport, CT: Meckler, 1989. Morris, Edmund. Theodore Rex. Random House, 2001. Roosevelt, Theodore. Theodore Roosevelt: An Autobiography. New York: Macmillan, 1913. Reprint, New York: Da Capo Press, 1985.